Bone marrow produces platelets -- also known as thrombocytes, and releases them into circulation. These small blood elements are pieces of larger cells. Platelets interact with a group of blood proteins called clotting factors to form blood clots. The medical terms thrombocythemia and thrombocytosis refer to abnormally elevated platelet counts. Disorders of the bone marrow and other medical conditions can cause an elevated platelet count. Essential thrombocythemia is a bone marrow abnormality which causes an overproduction of platelets. Platelets produced in essential thrombocythemia are abnormal. They may cause spontaneous formation of blood clots due to increased stickiness. Alternatively, they may not interact normally with the clotting factors, leading to easy bruising and bleeding. People with essential thrombocythemia have an increased risk of developing acute leukemia. An abnormally high platelet count caused by another condition is called secondary or reactive thrombocytosis. Cancer is a common cause of secondary thrombocytosis. Cancers of the colon, stomach, lung, breast and ovary and lymphoma are associated with increased platelet counts. Notably, the presence of an elevated platelet count is often an indicator of poor long-term prognosis among people with cancer. People with iron-deficiency or hemolytic anemia may have secondary thrombocytosis. Although the association between these forms of anemia and secondary thrombocytosis is well established, the precise mechanism by which this occurs remains an area of active medical research. Polycythemia vera is an uncommon condition in which the bone marrow produces too many red blood cells. Platelet production is typically also markedly increased. The increased number of red blood cells makes the blood abnormally thick, which slows normal flow. Possible symptoms of polycythemia vera include a ruddy skin complexion, headaches, shortness of breath, dizziness, chest pain and fatigue. 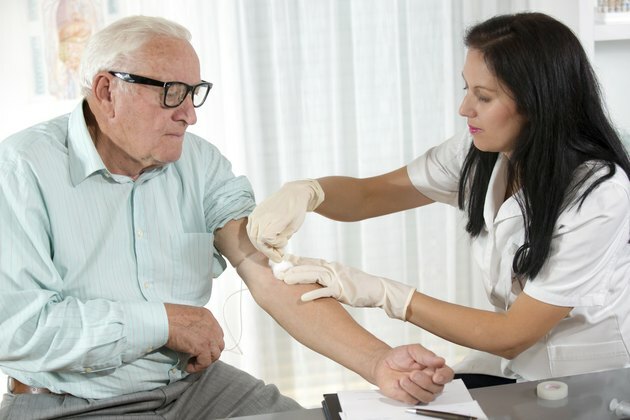 The mainstay of treatment for polycythemia vera is periodic therapeutic phlebotomy --drawing blood from circulation to reduce the number of circulating blood cells. People with polycythemia vera have an increased risk for acute leukemia. National Heart, Lung and Blood Institute: What Causes Thrombocythemia and Thrombocytosis?